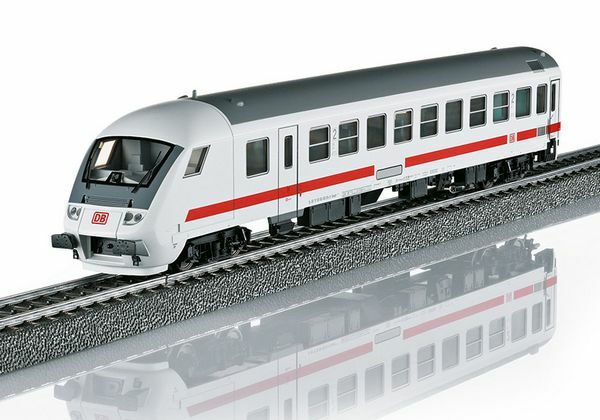 Prototype: German Railroad, Inc. DB AG type Bimdzf 271.0 Intercity cab control car, 2nd class with an engineer's cab for shuttle train operations. Model: The engineer's cab has interior details. The car has a detailed buffer beam. It has a separately applied front cowling. The 7319 current-conducting coupling or the 72020/72021 operating current-conducting coupler can be installed on this car by inserting it in the coupler pocket. Length over the buffers 27.5 cm / 10-13/16". When operated control car first, triple white headlights shine on the cab control car. When operated control car last, dual red marker lights shine on the cab control car.